A jet-set lifestyle doesn’t have to be all private planes and decadent digs. In Paste Travel’s Jet-Set Bohemian series, we blend the best of high and low for just the right balance … enticing everyone from backpackers to luxury boutique hotel lovers to come along for the ride. This summer I was given the task of planning a 10-day trip through France. Since I write about travel and live in Nice, my two friends and travel companions handed over the reigns for everything from booking hotels to mapping out train times. Hotels, of course, were out. Too expensive, especially with the option of living locally in a rental like Airbnb. Paris is known for its barges cruising up and down the Seine, as well as sitting tranquilly on top. At a party a while back on the Quai d’Austerlitz at Nüba, set on one of Paris’s largest terraces overlooking the Seine, I noticed that the petite barges scattered on the banks of the river were more than just the tourist cruise variety. Couples cozied up with blankets on the deck and bottles of Bordeaux for makeshift picnics, while others played cards and board games sans technological distractions. On Airbnb, you can find over 100 houseboat rentals along the Seine that go from rustic to regal, sleeping under the ornate Pont Alexandre III in a five-bedroom luxury boat or opting for something cozier like a 1930s one-bedroom barge moored across from the Eiffel Tower. It’s like staying in your very own floating hotel in the center of a city without ever having to worry about the hassles that come along with a typical cruise. After planning Paris, next came the hard part: Where to stop en route to Nice. I’d seen photos of the Caribbean-inspired beaches on the northern side of the island of Porquerolles, the largest of the three Isles d’or, or Golden Islands, a 15-minute ferry ride from the town of Hyères. On an island without cars that measures roughly 4 miles long by 2 miles wide, there aren’t many options when it comes to hotels. On Airbnb, listings showed only a handful of houseboats. Docked in port, this would be true South of France style sans all the glitz and glam of the yachts in nearby Saint-Tropez. When we arrived at Renaissance on Porquerolles’s port, the sailboat was just how owner Yann described: “folie douce,” or sweet madness. Close quarters doesn’t begin to describe it, as everything was expertly put in place Ikea-style to conserve space. The kitchen consisted of a mini fridge, hot plate and espresso machine. And the bathroom, well, there was a toilet in the corner. But it was exactly the type of no frills find we’d wanted. Yann also managed one of the bike rental shops on the island, showing us the best trails leading to the beach and recommending a few of his favorite restaurants in town for dinner. Back in mid-July, I made a quick weekend stop in Stockholm before hopping on a more traditional boat setting on a cruise to Russia. As I started scouring Airbnb options, my travel companion, Olivia, brought up The Red Boat. Recommended by one of her friends at National Geographic, this boat hotel isn’t only convenient (and cheap for a city like Stockholm), it’s also an experience as far away from the design savvy Swedish hotels you can get. In a city that’s comprised of 14 islands connected by 57 bridges, sleeping on the Venetian-style canals makes sense. Docked next to Central Bridge just across from hipster island of Södermalm lined with vintage shops and cafes, the riverside lodging is made up of two ships: The Red Boat and Ran af. The wood planked rooms go from basic summer camp chic bunks (red knit comforter included) and work their way up to the more luxurious admiral quarters in the hotel side of the ship. Lounge chairs on the deck look out to land and the hostel-inspired common area looks like a sailor’s haven, with nautical knick-knacks hanging from the ceiling and wall giving the illusion you’re out at sea rather than a 10-minute walk from Stockholm’s Old Town. 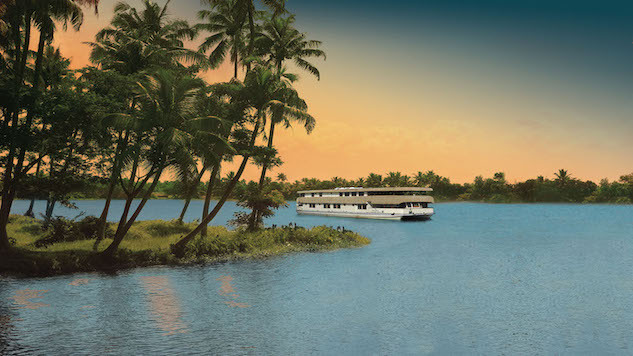 As you cruise past rice paddies and villages through Vembanad Lake, you’ll wine and dine in luxury with 24-hour butler service and gourmet fare in the form of authentic Keralan delicacies (think coconut prawns and local red rice) served up at wooden tables in the intimate dining room or out on the deck in wicker chairs. While your home-away-from-home for the evening will be on the lake, you can set off deeper into the backwaters on a narrow rice boat on a sightseeing trip to 100-year-old Hindu temples and a traditional Kerala tharavad, or family residence, to see how the locals live. Lane Nieset is Paste’s Jet-Set Bohemian columnist and a freelance writer covering all things travel from her home base in Nice, France.